Today, for Friday, the supposed final working day of the week, we have the Three of Arrows come out and join us. The key word for this card is Jealousy. 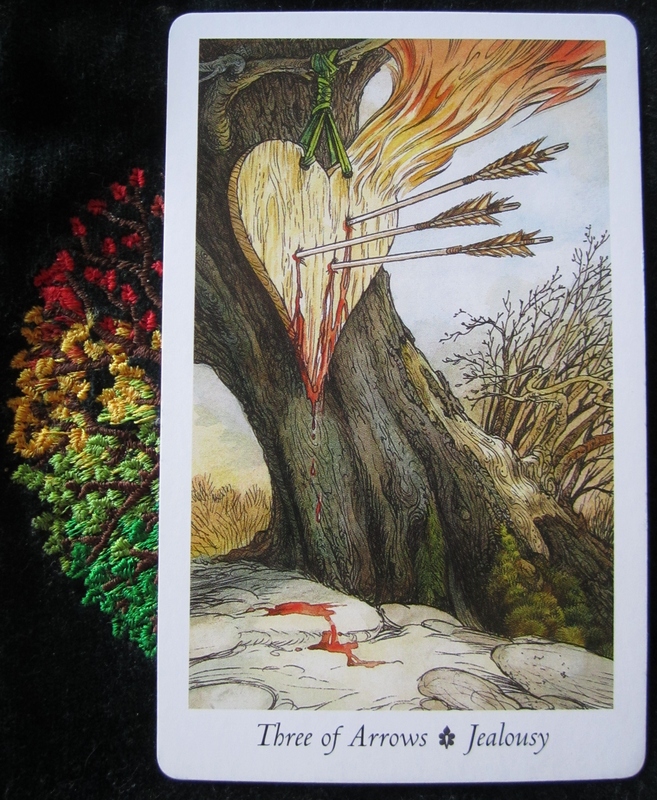 As the image suggests, the Arrows have pierced the heart: and if the Arrows are like Swords (for they’re the air symbol) then is it a case of heart being broken, pierced? A mind over matter / emotions type of thing? Is it enough to just be jealous? Or is that too much? Sometimes, it hurts and we get angry. Sometimes it’s the tension that make us angry, fearful, envy or jealousy between people. Where and why people get jealous is probably infinite. Some people play games to make others jealous or worse. That I feel just comes from bad upbringing and bad peer guidance. It can also be the failure to enforce social responsibilities and parameters. There are always some who seem to have more, or seem to be gifted with remarkable good fortune. The healing balm for envy (according to the book that comes with the deck) is humility, acceptance and forgiveness, even in the face of bitter rivalry and anger. This may need reinforcing a lot and refocusing one’s energy into a positive and creative momentum. So, what does this mean for today? Lots of things I suspect. Not letting people get under your skin is a good start, not getting angry at people’s stupidity is another… the list is endless! Whatever your triggers are, today is the day that you might just want to remain calm under pressure! I have space in the evenings for readings at the moment, which you can book here.